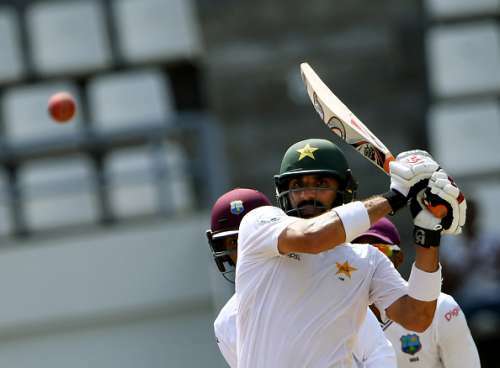 West Indies managed to survive 11 tricky overs on Day 2 at Dominica without losing a wicket after Pakistan made their way to 376 in their first innings after playing close to 147 overs. The rather slow run rate was surprising given that the pitch favoured batsmen despite being on the slower side. Azhar Ali completed his hundred and crawled to 127 off 334 balls while Misbah-ul-Haq in his final Test made 59 from 148 balls. The slowness of the innings seemed to have irked the usually aggressive Sarfraz Ahmed. The wicket-keeper walked out, took guard outside his leg-stump and was intent on carting the bowlers. He took Pakistan to 376 from 322/8 after Holder's twin strike. Roston Chase made use of a slow pitch to take four of his own. Kraigg Brathwaite and Kieron Powell then played out 11 overs with good technique and judgement. Brief Scores: Pakistan 376/10 (Ali 127, Misbah 59, Chase 4/103). West Indies 14/0. Here are the talking points from Day 2 of the final Test at Dominica. Both Misbah-ul-Haq and Younis Khan are playing their final Test for Pakistan. Younis walked out to bat on Day 1 on the back of a rousing reception from the Windies but his stay did not last long into Day 2 as Jason Holder trapped him in front for 18. Younis reviewed but the on-field call was upheld by the third umpire. Misbah-ul-Haq walked in at the fall of Younis' wicket and was welcomed by a guard of honour from the Windies. Dowrich, the keeper had so much more respect for Misbah that he dropping him on zero. The Pakistani skipper, who was on 1 off 52 at one stage, went on to notch up a slow half-century before Chase got rid of him at the stroke of Tea.